This can be done in a long day, but an overnight stay may be better. 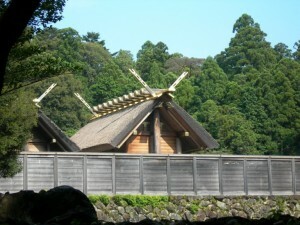 Ise is one of the oldest and most sacred Shinto shrines and Toba is noted for pearls. Take the JR to Osaka and change to the Loop Line. On the Loop Line get off at Tsuruhashi and change to the Kintetsu Line going to Toba. Take the Limited express. There is an additional charge depending on which train you take. Nice ride through mountains and countryside. At Toba station there is an island a short walk away. On this island there is a museum about pearls and pearl diving exhibitions, interesting, but it may get really crowded. There are boat tours available and some good walking up in the hills. On the way to Toba you will pass Ise. There are many maps and directions to the shrines from the station. The main shrine is one of the oldest in Japan.